Located in an heritage house on Kent Street in the center of Sydney, Tetsuya’s Restaurant is definitely one of the most famous fine dining restaurants in Sydney. You may even ever recognized this is a restaurant when you walked by, the hidden gem features a traditional Japanese garden and a very peaceful enviroment. A little bit about chef Tetsuya. Over the course of his career, Tetsuya has won acclaim not only in Australia, but also internationally. Tetsuya’s featured in Restaurant Magazine (London) World’s 50 Best Restaurants from the list’s inception in 2002 through to 2013, and Tetsuya has earned international recognition as one of the world’s great chefs, acknowledged by his peers, the media, and diners around the globe.In late 2013 he was honoured by the Japanese government, as the first ever internationally based chef to be recognised as one of Japan’s Master of Cuisine. Tetsuya’s offers a 10-course degustation menu price at $220 per person (tax included). The dishes combines both Japanese and French techniques by using the best local seasonal produce. The food is quite unique compare to the rest fine dining restaurnat in the city and country. Tetsuya's also offers one of Sydney's best wine lists and sommeliers to complete your meals. My camera went wrong that night thus i lost some pictures i took at the restaurant. There were two selections of freshly breads, multigrain and wheat sourdough, I had the sourdough which has a gold curst with a warm, fluffy inside. I loved the truffle butter which was soft and flavorful, paired so well with the breads. My partner doesn't like crust at all and the server kindly cutt off the edges for her - the service was indeed good. The amuse bouche was a chilled potato and leek soup with Marscapone ice-cream, the creamy texture was unexpectedly refreshing. The marscapone ice cream was quite special, its slight sweetness paired very well with the smooth soup and crisy puffs. 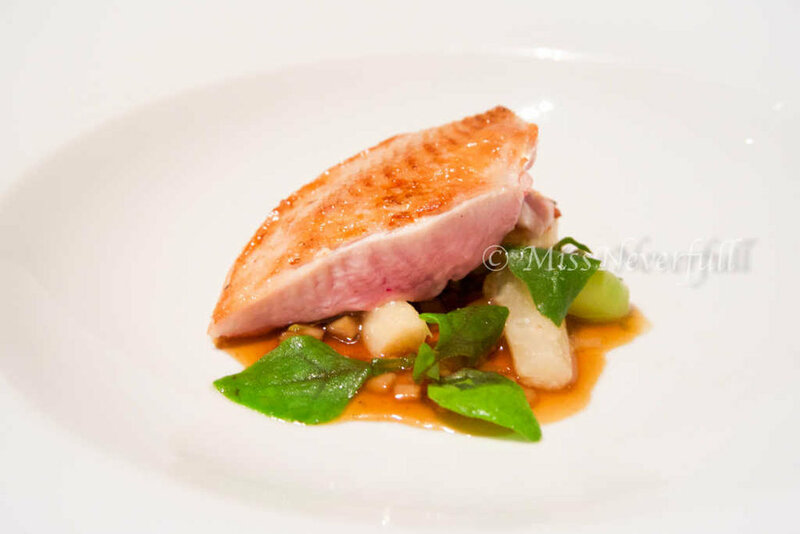 The first dish was soy poached tuna, it was amazingly succulent and high in flavor. The juicy sea grape and eggplant balanced the saltiness of tuna very well.The complex texture of crispy sea grapes, smooth eggplant and melt-in-mouth tenderness tuna was beautiful. During my food trip in Australia, the scampi was one thing i really enjoyed eating. 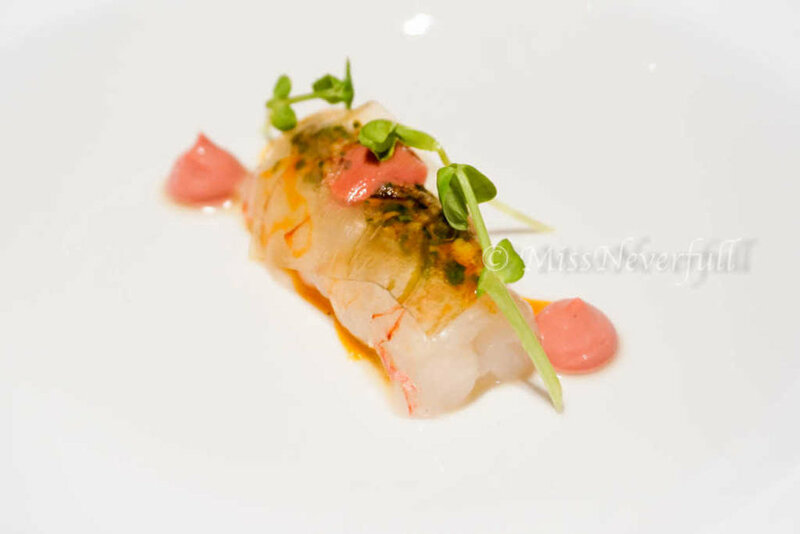 This scampi dish at Tetsuya's no doubt wins my heart again. The scampi was very juicy and the texture became richer and creamier after chewy, it was very high in 'prawn flavor and quite sweet it self. The chicken liver parfait has a deep flavor and was fluffy, paired with the coated scampi oil to enhance the shellfish flavor, the combination was lovely. The aftertaste was simply a bless. Next came the signature and most famous dish at Tetsuya's - Confit of Petuna Ocean Trout. Its pretty color was simply a piece of art, absoutely too beautiful to eat. Its lovely fragrance from the seaweed layer made me very hungry when it just arrived the table.The trout confit was quite large in size compare to the average portion size in most of fine dining restaurants. The ocean trout was very high in quality, you don't even need to put too many effort to split the buttery flesh. The trout itself was juicy and rich in oils but not greasy at all. However the layered seaweed powder was too strong for our liking, it taste like the seasoning powder from the instant noodles. Even under the help of the refreshing pomelo & daikon salad, the entire dish was till too heavy for us. I rather enjoyed the trout roe on the side which exploded in my mouth with a balance savory and sweet flavor. While for the premium quality trout, both of us ended up with taking apart the top layer. A dish of green leaf came with the trout as well, which is also for accompanying with the rest of main courses. The aromatic plate of grilled tooth fish was served after thee trout. The tooth fish was perfectly grilled, underneath its crsipy skin was succulent flesh. The warm ragu was placed on a bed of miso corn puree, which has a strong 'corny' smell as well as flavor, it balanced very well with the fish. 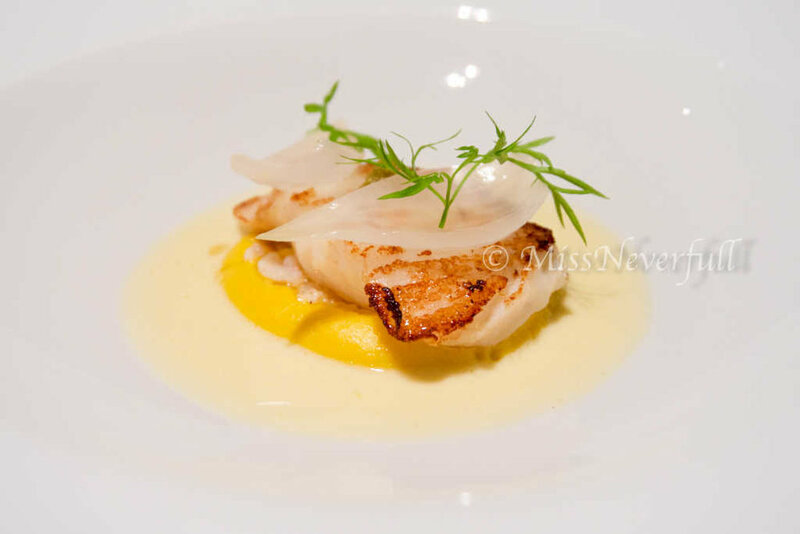 Unlike any john dory dishes i had before, this john dory dish was thin sliced and cooked medium, paired with light vinegar and chestnut mushroom. The most impressive part of the dish was the crunchiness of the fish, its simple umami taste was lovely as well. It was my first time having partridge, and it was indeed impressive. Its pink inside was extremely succulent and flavorful, the skin was crispy and has a lovely grilled fragrance. The jus has a sweet soy hint, deep in flavor but not heavily. The Japanese root vegetables hidden underneath added some crunch and refreshness, the entire dish was delicious and enjoyable. For the main dish, guests can pick their preference of doneness. We were advised by our wait that the perfect texture was medium rare, certainly. It looks drooling when it presented in front of us. The veal tenderloin was incredibly succulent and flavorful, its pretty pink color won't lie. The light soy works well with the amazingly juicy veal tenderloin, and the herbs too balanced well. One of the best veal dishes so far. We were then served a palate cleanser. The peaches were 100% mature (if you know a little bit about Japanese fruits), so juicy and sweet. The peach jelly was quite refreshing and added a bit crunchy texture. The figs were very juicy, not very high in sugar content but the wonderful sweetness as a dessert. Paired with squirts of molten white chocolate and preserved lemon, the creamy texture and the sourness of lemon balanced very well. A very creative combination, but the taste was not very impressive even for a fid-lover like me, my friend doesn't like figs at all so she think this was very average. Another item i came for besides the ocean trout was Tetsuya's chocolate cake. It looks very fair when it first came to our table, but i took my words back when i see the beautiful layers and later tasted it. The chocolate cake was made of dark chocolate icing, mousse, cream, sponge and a crunch base. The mousse and creamy was super airy light and rich, not that heavy as it looks because of the bitterness of the chocolate. Really enjoyed this piece of textual and wonderful chocolate cake - the best chocolate cake so far. 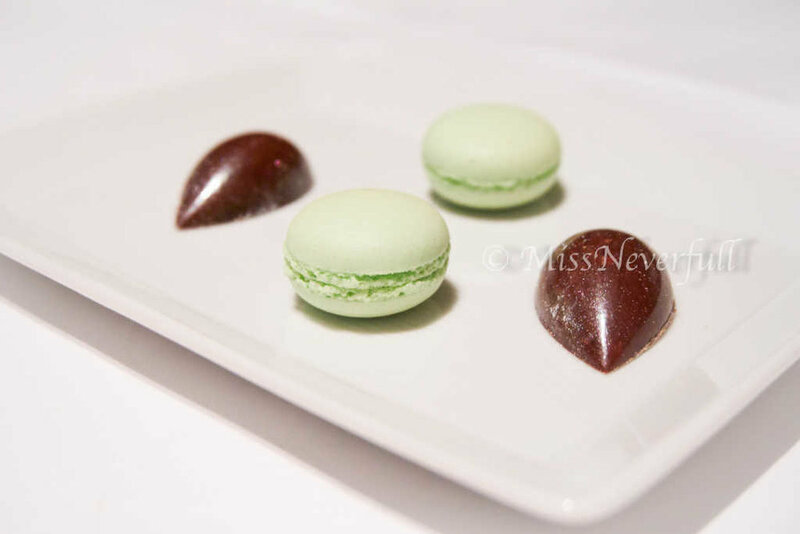 The meal ended with a cup of tea/coffee paired with Petit fours - tear drops of dark chocolate and macarons. I forgot the flavor of macarons but its texture was disappointing, it got stick on my teeth. Tetsuya's is a very unique restaurant among all the fine dining restaurants in Australia, as French food with a Japanese twist is not very common outside Japan. The quality of ingredients was no doubt very high, with very high culinary skills. The flavor of the dishes were quite simple, ingredient-driven, which best keep the flavor of the ingredients. However, the siganture ocean trout was disappointing - too salty and heavy. While the other meat dishes were not too bad. Loved the chocolate cake to draw a sweet ending.